Goodbye, NX. Hello, Nintendo Switch. Nintendo has just revealed the long awaited home and portable console hybrid, complete with removable Joy-Con controllers for multiplayer action. 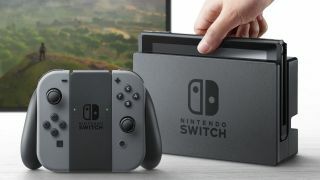 In terms of games, the Nintendo Switch has already been seen playing Skyrim (presumably the inbound remastered Skyrim: Special Edition), Splatoon, an NBA game and Legend Of Zelda: Breath of the Wild in the trailer. Even more interestingly though there's also footage of what looks like new Mario Kart 8 content and a new 3D Mario game. And here's what looks like a new Mario game. Anyone seen that desert town before? Nope, didn't think so. We've also had a list of confirmed developers and publishers who will all be announcing support for the Nintendo Switch. Note From Software is in there!